Sedgwick has been a manufacturer of machines to the woodworking industry for more than five decades and over that time has established a reputation for producing good solid machines. It's a reputation that embodies steadfast reliability and a common bond amongst tradesmen the world over. The machine that launched the company was the 571 hollow chisel mortiser and it's still in production with more than 10,000 units in operation today. Unless you collect brand names with all the enthusiasm of a train spotter, it's quite possible you will have used more Sedgwick machines in your woodworking career than you can remember. There are more than a handful of UK-based companies that have fallen by the wayside in recent years, a few have survived by diverting their attention away from manufacturing to re-selling. The success of the few is largely down to a reputation based on machines from an earlier time that have become industry favourites. But in 2013, Sedgwick remains the UK's largest manufacturer of woodworking machines with the entire design and build process still contained in-house. Now you can't exactly say it's a little-known fact: the name Sedgwick is a rhetorical question prompting the fact, usually through tight lips and a furrowed brow. Yes, woodworkers of a certain age do have a constitutional tendency towards a gloomy outlook. They may be predisposed to bouts of melancholy but deep down, what they really want is a machine 'made the way they used to make 'em'. Now if that's not too much of a contradiction and you'e happy to go without some of the whistles and bells, then a Sedgwick machine is unlikely to disappoint. The TA450 ripsaw is the latest machine to be developed and built in the factory in Leeds. 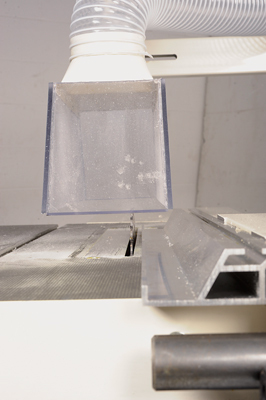 It supersedes the old TA400, increasing the cutting capacity from 125-155mm at 90 degrees and 105mm at 45 degrees. The 6.5hp 3-phase motor is braked to meet with current regulations and runs with barely a tingle detected through the cast iron top. Three belts drive the spindle and the whole assembly is now mounted on two trunions placed fore and aft the blade. The blade on this ripsaw is tilted and raised on square thread screws via wheels at the side and front of the machine casing. Both are easy to access and the mechanism is tight without being hard work. There are no dials to suggest that you are operating to within a hair's breadth, only a scale that is large enough to read without having to strain either your back or eyesight. 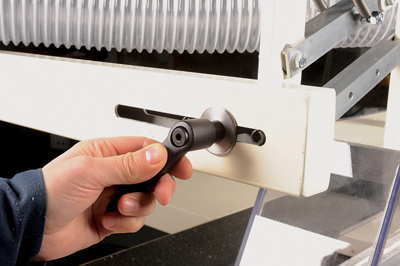 I don't find the lack of technology to be a problem as I rarely enter the machine shop without a digital Vernier calliper in my pocket. A single means of calibration is surely more accurate than wondering if that 0.8 is the same on the saw as it is on the spindle and thicknesser. The basic machine is precisely that, basic. 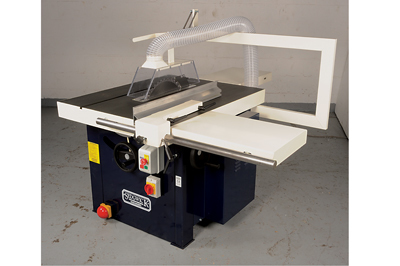 There are run-out and crosscut tables available as accessories that turn it into a versatile workhorse capable of cutting mitres, compound angles and end trimming. The scale and capacity are ideally suited to converting heavy stock and with the right combination and a good blade it's capable of working to fine tolerances subject to initial accurate setting up of the machine. You're never going to process vast amounts of sheet material as efficiently as you could with a sliding panel saw but then the footprint on the TA450 is a lot less and, to be honest, the power would be wasted. The adjustable mechanism for the support arm holding the clear plastic blade guard is a little crude, but it's no less functional for that; in fact it's the general theme throughout. It wouldn't take too much to attach the extraction hose to the arm with cable ties to tidy things up. The cast-iron bracket holding the aluminium fence is built to a similar agricultural spec, but as with the rise-and-tilt mechanism, it's as smooth as any. The fine adjuster on the ripsaw moves the fence across the table, maintaining perpendicularity with the blade. In the way that there's nothing to get excited about with the TA450, there's even less to complain about. It may lack some of the finesse found on some Continental machines commonly found in cabinet shops, but where it counts Sedgwick appears to have ticked all the boxes. The features I liked the best are ones that won't score points with everyone. 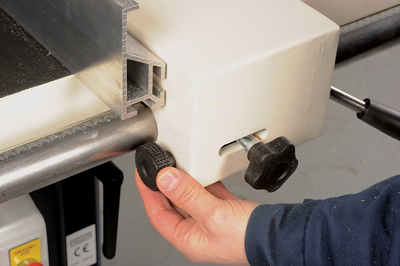 For example, you can gain access to the cabinet interior from the back of the machine to clear out waste and retrieve the odd piece of tooling when it comes to blade changes, and with the fence moving across the table without any resistance it adds up to a positive experience all round. Incidentally, the Atkinson-Walker blade we were supplied with was the perfect partner for this machine.